I tried out a new-to-me indie pattern company this month! 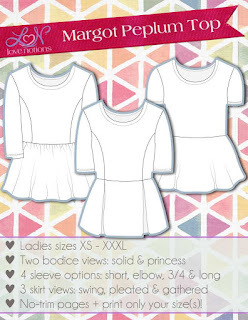 For some reason, I recently got it into my head that I wanted to make a peplum knit shirt, and when looking around I found this design by Love Notions, a company I hadn't really paid much attention to before, thinking that it was a lot of children's patterns. I was wrong -- I found this lovely Margot Peplum top, at a time that there was a sale on. So I bought it, traced it off, and finally got around to making it this month. I used a thrifted poly knit which is kind of heavy and less stretchy than is optimal. But I thought for a first try of this pattern, it would be sufficient, and besides, I loved the polka dot print. 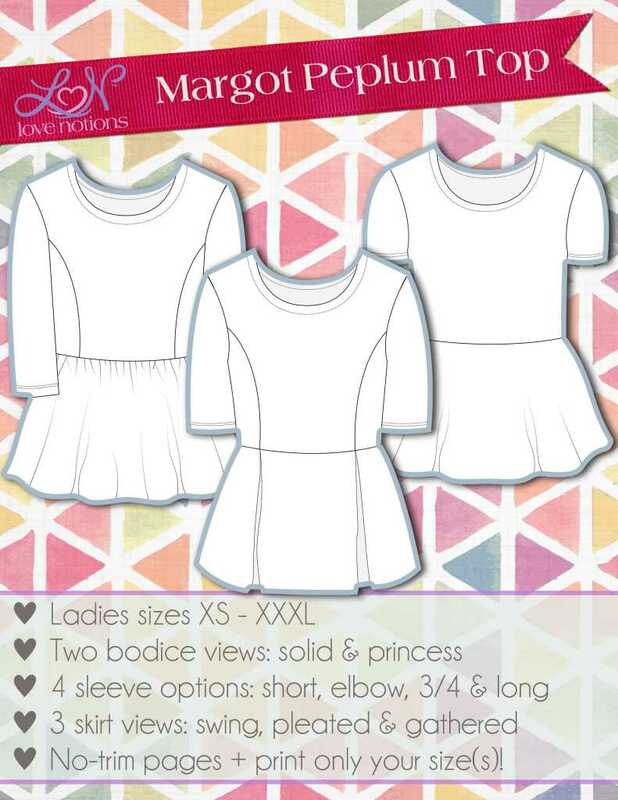 There are a few options to combine in this pattern - this time, I chose to make the solid bodice, with elbow sleeves and the swing skirt. It all fit together beautifully. I fall smack in the middle of M & L in the sizing so cut about midway between those sizes. I used a narrow zigzag stitch on most of the construction and it seems to have done the trick -- this knit is not going to fray or ravel, or probably ever self-destruct in a million years. I did extend the length of the peplum by an inch or so, as I like a bit more of a tunic-y length to my loose tops. And I finished the neckline with a bias facing. I really like the way it has turned out. I think this might be another reliable pattern that I will end up making more than once -- I'm even thinking of extending the peplum and making this into a dress, as I like the bodice fit a lot. Perhaps I'll even try the princess seam version sometime! Nice- that would indeed make a great dress. I made myself a peplum top a few years back...and on my shape and size it looked horrendous...like a fat lampshade. I'm jealous! haha! I'm sure it wasn't as bad as you think - we are always so hard on ourselves :) But peplums are indeed tricky, I agree. I was quite pleasantly surprised by this one!